"I'm prepared for this, Jim. And I'm going to accomplish it. I know I won't get but this one opportunity and you can bet your life I'm not going to spoil it." The DVD review is by Dan Heaton. Rarely has a film's title revealed its climax with such undisguised clarity. From the beginning of The Assassination of Jesse James by the Coward Robert Ford, we clearly understand that the famous outlaw will not survive until the end. Played with a weary cynicism by Brad Pitt, Jesse hardly resembles the charismatic villains of the classic Hollywood westerns. As the story progresses, Jesse evolves into a paranoid thug who�s willing to murder his associates based on even a minor suspicion. It's a tricky performance for Pitt, who must blend shadows of Jesse�s infamous reputation with his later day misfortune. Rising to fame with his older brother Frank (Sam Shepard), Jesse is unwilling to fade slowly into the sunset but too mistrustful to recruit an effective gang. He seriously longs for another rich score but trusts no one, and his personality shifts between geniality and utter nastiness. Frank is a grizzled veteran ready to settle down, and he disdains the wannabe outlaws that ride Jesse's coattails. His ability to dismiss the past saves him from his brother's fate, which differs considerably from the glorious deaths of typical movie legends. The story begins in August 1881 and depicts the Blue Cut train robbery�the last great caper of the James gang. Jesse's accomplices for this heist are mostly small-time criminals, not the hardened outlaws from the James gang�s heyday. They bicker over minor issues and are a pretty sorry lot. One of the robbers is Charlie Ford (Sam Rockwell), and his involvement brings Jesse into contact with his younger brother, Robert Ford (Casey Affleck)�an obsessive James gang admirer. The 19-year-old has collected the grand stories and tall tales for years, and his fixation on Jesse mirrors today�s celebrity-obsessed culture. Robert is a quiet, creepy fellow who longs to be someone, but lacks the basic social skills. However, his strange, yet low-key demeanor makes him a safe choice for Jesse, so he allows them to become allies. Affleck earned a Best Supporting Actor nomination for this intriguing performance, which outshines Pitt's uneven depiction. As the youngest member of the group, Robert is incessantly harassed by everyone. This only causes frustration, intensifying his attempts to be somebody. Affleck is generally a charismatic performer, and his ability to play such an eerie but understandable guy is surprising. New Zealand filmmaker Andrew Dominik earned tremendous acclaim for his debut picture Chopper, which offered another fictionalized version of a real person, Mark Brandon "Chopper" Read. Supported by the elegant cinematography of Roger Deakins, Dominik aims to craft a transcendent picture like Terrence Malick's Days of Heaven. Certain scenes are remarkable and come close to reaching that level, but the overall result is inconsistent. The 160-minute running time is too long to support a personal, slow-moving tale. Garret Dillahunt, Paul Schneider and Jeremy Renner are memorable in supporting roles, but the film grinds to a halt when Pitt and Affleck leave the screen. The Jesse/Robert confrontation is interesting, but it's never clear why the lengthy exploits of the other characters are so essential. The deliberate pace allows for some pretty footage of open landscapes, but long shots of Pitt doing nothing become snooze-inducing by the third hour. Some serious editing might have led to an Oscar-caliber picture. Instead, we're left with a sometimes-brilliant, often-disappointing experiment. The Assassination of Jesse James by the Coward Robert Ford is a divisive picture that will intrigue some audiences while driving others crazy. My experience offered both of these extremes at different points during the viewing. One aspect that's surprisingly effective is the frequent narration, which shifts between historical information and literary passages. This film is adapted from Ron Hansen's book, and I expect the narrator's words contain language taken directly from that piece. This device builds on the story's somber tone by revealing the inevitability of the entire proceedings. The epilogue showcasing Ford's experiences after the killing (including where the title "coward" comes from) are especially poignant and reveal that Jesse�s death served almost no one's interests. If Dominik's screenplay had focused less on ethereal images and more on Ford's later plight, it might have avoided drifting into sleepy territory. However, it's exciting to see a writer/director take a chance and avoid the safest route. During the past few days, I've reflected sadly on the picture�s final act, which grows more interesting with each consideration. It's the least-predictable section and poignantly shows the sad final chapter of Robert Ford's life. I don't expect to revisit this film anytime soon, but am glad to see a studio picture that confounds expectations, even when it fails. Image Transfer Review: The VC-1-encoded image looks pretty good overall; the grain stucture is nicely preserved, and Roger Deakins' vistas of blowing wheat are gorgeously represented in the HD version. The wide format is brilliantly used to maximum effect, though the muted golden palette may limit the eye-candy aspect of the picture. Black levels are very good, and overall the HD version is a highly satisfying experience. There is some edge enhancement visible at times, however (quite so at 34m:38s, in the shot of Affleck in the doorway), which knocks the score down a bit. Audio Transfer Review: 5.1 tracks in English, French and Spanish are included, although they offer a rather pedestrian soundstage. There is acceptable separation and depth. The timbre of the strings is quite effectively carried across at times. While not spectacular, there is little to complain about here. 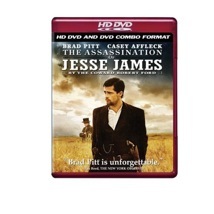 Extras Review: The HD DVD side of this combo offers an exclusive extra not contained on the barebones DVD: an HD version of The Assassination of Jesse James: Death of an Outlaw (31m:46s). Contrary to the representations on the packaging, this is not a "making of" at all, but a biographical examination of the life and death of the outlaw, with the actors offering comments on their characters and their motivations. It's not bad, and offers considerable emphasis on James' career as a young Confederate guerrilla and the motivations that this experience created in him. Brad Pitt's star power wasn't enough to generate box-office interest in the lengthy epic The Assassination of Jesse James by the Coward Robert Ford. It lacks the crowd-pleasing action of the recent 3:10 to Yuma and takes a revisionist look at the Western myths. The film is seriously uneven, but it's worth a rental if you're searching for a different take on the genre. The HD DVD at least offers an extra not found on the otherwise extra-free standard DVD.